You may have noticed a new piece of kitty-furniture in our Townhouse photos as of late. 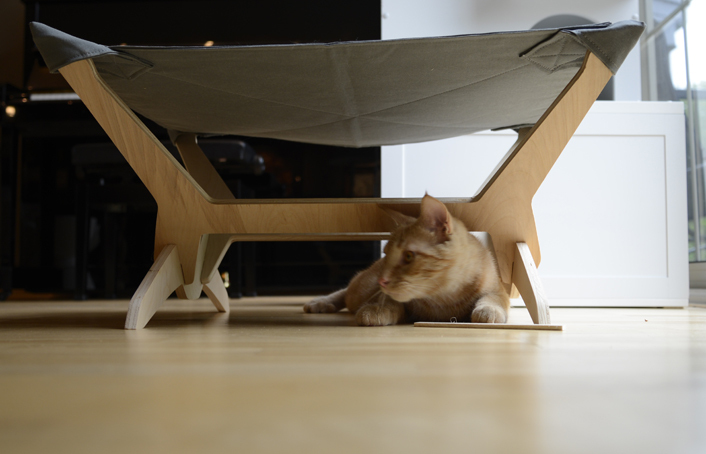 Just a couple weeks ago, the super nice people at Peach Industries sent us one of their cool kitty loungers to try out. And here's the best part...they want to give a lucky GLOGIRLY reader a kitty lounger of their very own! WAFFLES TOO: Um, but WAIT! There's MORE! KATIE: That's right Waffles. They're also giving away one of their hip t-shirts to ANOTHER lucky reader. WAFFLES TOO: Um, Boss? Do hips wear t-shirts? What's a hip t-shirt? KATIE: *rolls eyes* Waffles, just stick to the script. WAFFLES TOO: Um, yeah right Boss. Um... do you have the script? 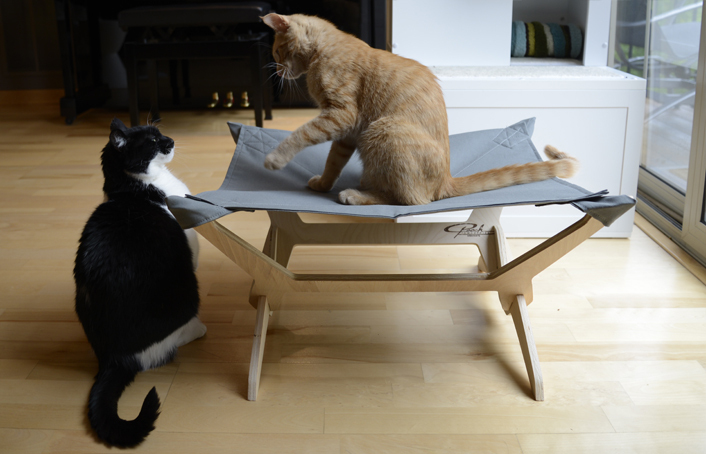 KATIE: *sigh* We love this new lounger SO much, we want to tell you a little bit about it. WAFFLES TOO: Um, I love it so much I want to marry it. WAFFLES TOO: I can't remember my part. Something about love? KATIE: The Peach Industries Kitty Lounger is the product of two people in love. One day a clever industrial designer married a Vet Tech. And the next thing you know...a brand new Kitty Lounger was born. WAFFLES TOO: Does this mean we're gonna talk about bees and birds now? 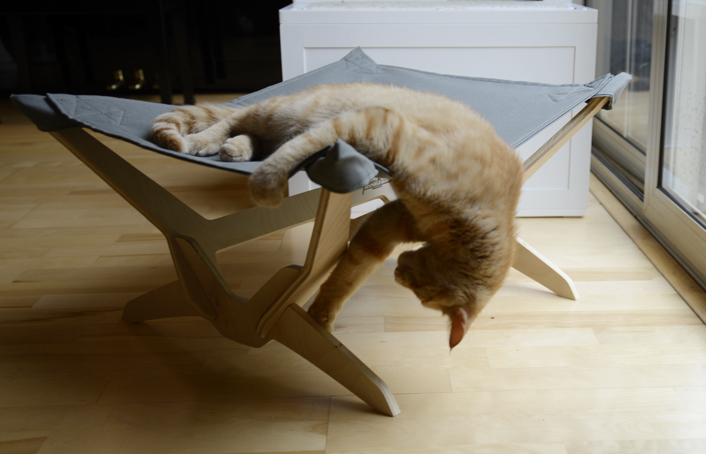 KATIE: *shakes head* Their kitty lounger is a beautifully simple and modern design. You don't need any tools to put it together. There's not even any hardware. It's just four pieces of interlocking Pure Bond birch plywood and a cotton cover with pockets at the corners to keep it in place. 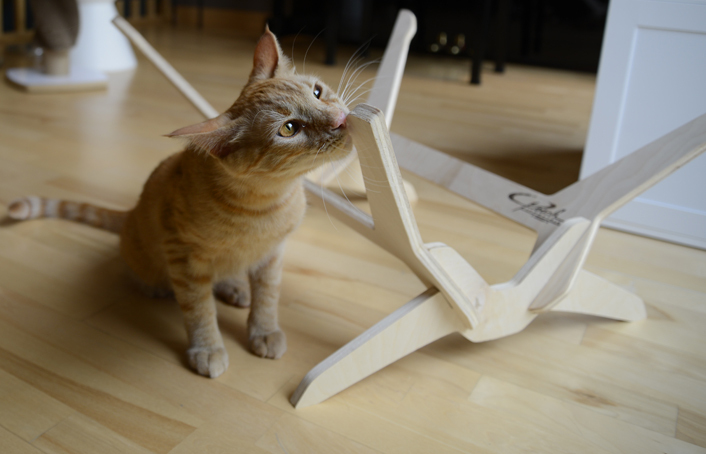 The special wood used is sustainably grown in the USA and made with formaldehyde-free soy based glue that's safe for both pets and people. And the grey Kitty Lounger fabric is 100% cotton grown and woven in the USA. WAFFLES TOO: Um, that means the lounger is very eco-friendly. That's especially good cuz you don't want to go making the eco mad. If the eco is anything like Katie, that is. WAFFLES TOO: Um, and it also comes in a cool burlap tote that's almost as much fun as the lounger. 1. Which kitty lounger do you like the best? 3. Make sure we have your email. WAFFLES TOO: Um, yeah...lots of humans mess up the email thing. The Boss says to make sure your email is connected to your profile when you comment. And if it's not or even if you're not sure, just put your email IN your comment. We promiss not to do anything spammy with them. KATIE: And if you'd like to earn some extra chances at winning, just leave a separate comment for each...we're operating strictly on the honor-system. Deadline to enter is 11:59pm EST, Saturday June 8. Only US and Canada readers are eligible. You must follow the comment instructions completely. Winners will be drawn randomly using Random.org. Winners will be notified via email and must respond within 48 hours with name and mailing address. Peach Industries gave us our lounger, but our review is the honest-to-Cod truth. It's our favorite lounger EVER. Oh and we already like Glogirly on Facebook (I think. We'll go make sure that's true). We like the Watercolour lounger best! The cat and mouse t-shirt is awesome, but they don't make plus sizes. Hey Laura! Just let us know your size...the Peach People said they'd get whatever size the winner needs! We like the Cat & Butterfly Kitty Lounger, and the Cat & Butterfly Kitty T-shirt in Charcoal, but there is no 2XL. No worries on the size, Anna! The Peach People just let us know that they'll get you whatever size you need should you win! We shared the giveaway on facebook. Oh how exciting! I will pass on both opportunities since my kitty is a barn cat that lives outdoors and I already have one of their way cool shirts. Will share though. Good luck to everyone! I liked Glogirly on FB a while ago. Definitely shared the giveaway on FB. Just testing to see if comments are working. Love the charcoal shirt (XL) and my cats would love any of the beds. Like Glogirly on facebook...Katie and Waffles Too Rock! Mollie and Louis checked out the loungers and they agreed (I almost fainted, they agreed) on the Cat and Butterfly Lounger and I would like the white Cat and Butterfly woman's top in white - large. Thank you for a wonderful giveaway! Linda, Mollie, and Louis. Our house already likes GLOGIRLY on Facebook. We love Katie and Waffles Too. We liked Peach Industries on Facebook. Oh, we also like you on facebook! That is an awesome lounger! I want one just like yours and I am am an XXXXXXXXXXXX-small... except I don't really want a shirt 'cause I hate wearing clothes. Oh, but my human's size is small (mediums and larges she wears to the gym, but these look cool enough to wear out and about). And she likes the art deco-y looking one (cat and butterfly) the best. I think both my human and I like you on Facebook. Loved the watercolored lounger and the cat and mouse t-shirt in XL. This lounger will be fought over in my house. My younger kitty will be lounging just like Waffles Too. Some kitty will be very happy. Have a terrific Tuesday. The lounger looks great. I am thinking of sending mum to live in America. Just popped back over to say concatulations on winning the PBM logo design. Well done. We did vote for you. 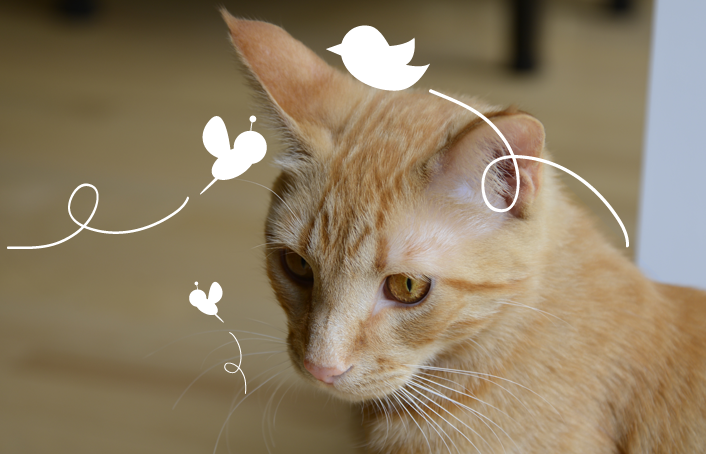 Thank you for your sweet comment about my Traveling Cats blog. Yours is cool too. I've been following for a while now. What an attractive design, and it looks really comfy! Thank you for the opportunity to enter to win one! We like the gray kitty lounger, because it will look great in our house, and we would choose the cat and butterfly t-shirt in size large. We aren't on Facebook so we can't do any of the extra entries, unfortunately. Great giveaway! My kitty would enjoy the Gray Kitty Lounger and I would like the Cat & Butterfly charcoal t-shirt in large. gracefuljoy(at)live(dot)com. Thank you! We like the gray kitty lounger. And the white cat and mouse t-shirt in large. But mostly we like Waffles saying not to make eco made if eco is anything like Katie. That made us laugh! We like the Cat and butterfly lounger and t-shirt (small). It looks like a great product, and if Katie and Waffles enjoy it, Thunder will too. We like the watercolor lounger and the cat and mouse white t-shirt (medium). Thank you for the giveaway! Cat & butterfly lounger, charcoal women's cat & butterfly T in size large. We already Facebook follow Glogirly. Thanks! I like the Kanji lounger and I bet my 7 kitties would too. Also, the Cat and Butterfly t-shirt is pretty (size L). I like the gray Kitty Lounger. The white vintage banner in large please. 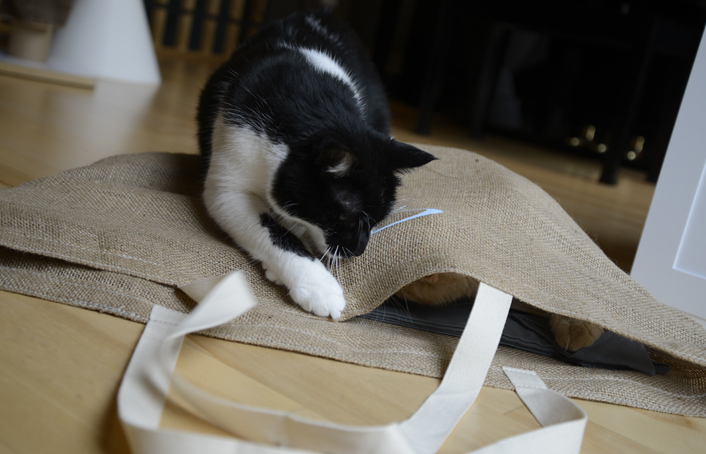 I've been admiring the Kitty Lounger, and the sack it comes in, on your blog for days! And I like Peach Industries on facebook too. i only came by to congratulate for winning the PBM contest, great design! and now i have a chance of winning something too, hurrayyy! I like you guys on Facebook a while ago. Love the additional look into the Glogirly life. I also liked Peach Industries on Facebook. And I just started following you on Pinterest. We liked Peaches Industries on Fb. We like the cat & butterfly lounger the best. Mommy likes the white cat & butterfly tee & wears a small. Thanks fur having the contest! I really like the Cat & Butterfly lounger and T-shirt. Tee in black, medium size. Love the lounge~ We would like the Watercolour lounger. And the Vintage Blogger Tee, Men's large. You can let us know the outcome at askfisher@gmail.com. Thanks so much! What NEAT stuff on that site! Okay... down to business. My favourite lounger was the cat & mouse one. The peep's favourite tee was the cat & butterfly one in charcoal. Large, probably. I shared your giveaway on FB. Ooh... I'll get ol' peepers to share it on her timeline, too. Will do that in just a minute, promise. I already like you on facebook and now I've liked Peach Industries, too. So has the peep. I'd like the cat and butterfly lounger and mom would like a white cat and butterfly t-shirt but she needs a 3x. My email is pumpkinpuddy at pumpkinpuddy dot com. Silly Waffles always getting mixed up hehehe! Looks like Waffles got to the new lounger first and isn't giving it up - too funny! 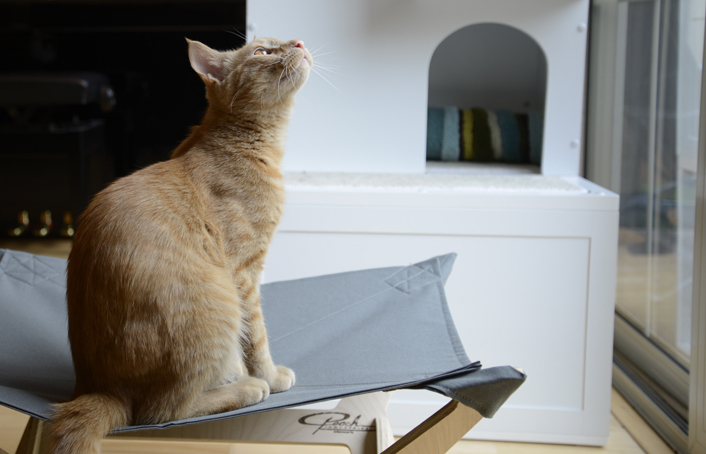 Woo, we love the Gray Kitty Lounger - it's an instant classic and will show off our 3 orange kittehs to their best advantage! Love the cat and butterfly in gray/medium! 1. Like GLOGIRLY on Facebook. -Of COURSE! 2. Like Peach Industries on Facebook. -Done! 3. Share this giveaway on Facebook. -Done! 4. Follow GLOGIRLY on Pinterest. -Done -cool, didn't know you were pinning, too! I liked Peach Industries on FB, and started following you on Pinterest, I already liked you on FB along time ago, and shared a the link on my page. ha ha - you outdid yourself on this post. I loved it - poor Waffles - always the "fall guy." That's a knock out contest you have going on. 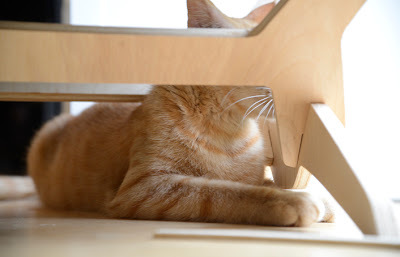 We like the Cat and Mouse lounger and the Cat and Mouse t-shirt in L.
We already follow you on Pinterest and Facebook and have "liked" Peach industries on FB. We're sharing this givewaway on FB too. We like the Cat and Mouse Lounger and the Cat and Mouse t-shirt in 1X. We already follow you on FB and Pinterest. Stopped in and liked Peach industries on FB. We like the Cat and Mouse lounger. Meowm likes the Cat and butterfly t-shirt in an XXL since she likes to sleep in them. We shared your give away on Facebook. We tried to join Pinterest to follow you, but it doesn't seem to be working. Awesome giveaway. Thank you for the chance. I would love the "Cat & Butterfly Kitty Lounger" and for the t-shirt "Cat & Butterfly Kitty " in size XXL. Liked Peach Industries on Facebook(sue brandes). Shared giveaway on Facebook(sue brandes). Already follow GLOGIRLY on Pinterest(sue brandes). Concats! I'm guessing my last minute vote put you ahead for good in the logo contest. Now onto the lounger. You have my email. I'm figuring between the Catty Stacks, the Cabana I just won and the lounger, the peeps will probably have to get rid of their couch to make room. Sounds good to me! I'd like the cat and mouse t shirt, Med or Large in white cos it's cooler in summer and the Cat and Butterfly lounger. Yo! Like you on Pinterest too! Dang, that is cool, but no browsing time today! 1. Which kitty lounger do you like the best? We like the Cat and Butterfly Lounger. Fantasmic give aways...luvluvluv them both...but you have lots of entries already...we will just give congrats to the winners..
We already liked Glogirly on Facebook! We liked Peach INdustry on Facebook! We shared this contest on Facebook! Oh I love the Polka Dot Kitty Lounge! The men's Cat & Butterfly T! But they probably don't have a XXL? What a thrilling contest! We LOVE the cat and mouse lounger and the cat and mouse t-shirt in the charcoal gray...the mom wants a M since they don't come in our sizes. We like you and follow you guys everywhere! And now we like Peach Industry on FB too! We love the cat and mouse lounger and the men's cat and mouse t-shirt in a XXXL possibly? We like the lounger that has the watercolor fabric on it. The Cat and butterfly tshirt, probably XL. I came to say our congrats on the mall design, but can't resist a giveaway! Can I enter if we're doing our own giveaway? My choice for t-shirt is charcoal cat and butterfly in medium and cat & mouse lounger but if I win I'll donate it to my local shelter since Peach Industry is our latest sponsor. We like you on Fb, Pinterest and like Peach Industries. We have never seen so many comments. Chances of winning this are pretty slim. But here goes. We like the Cat and Butterfly lounger and the Cat and Butterfly in charcoal in medium. 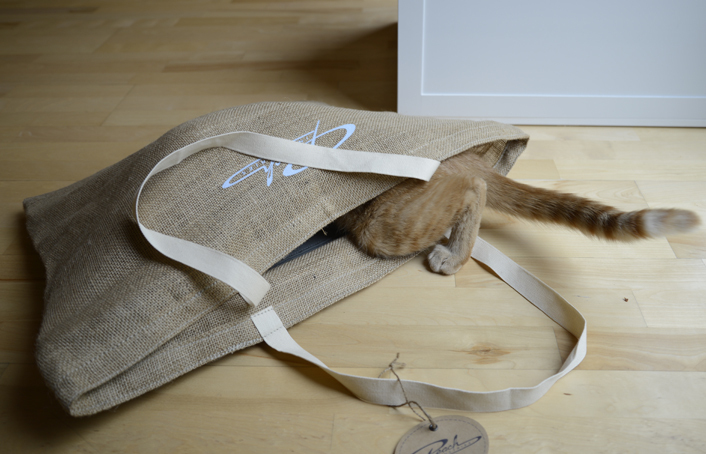 Our e-mail is: janet.blue@thecatonmyhead.com. Wow look at all of your comments Katie and W2! We can understand why those are so super things in your contest. We went and looked at Peach Industries website and love the cat and butterfly lounger and the cat and butterfly t shirt (lg) in charcoal. -- The cat and mouse! such a cute design. And it would match Marina's fur purrfectly. 2. Which t-shirt is your fave and what's your size? That is a super dooper lounger and great giveaway! I like the watercolor lounger and the cat-butterfly tee in large. I have liked you on Facebook for a long time! LOL. I just liked Peach Industries. I like the kanji lounger. These are all beautiful! I would love having any of them to sleep on. I also like the tulip tee. It is lovely!! (I wear a large just in case I get lucky). Had not seen these loungers before but it is now at the top of my wish list. Love that pawesome lounger - so sad I'm not eligible to enter! 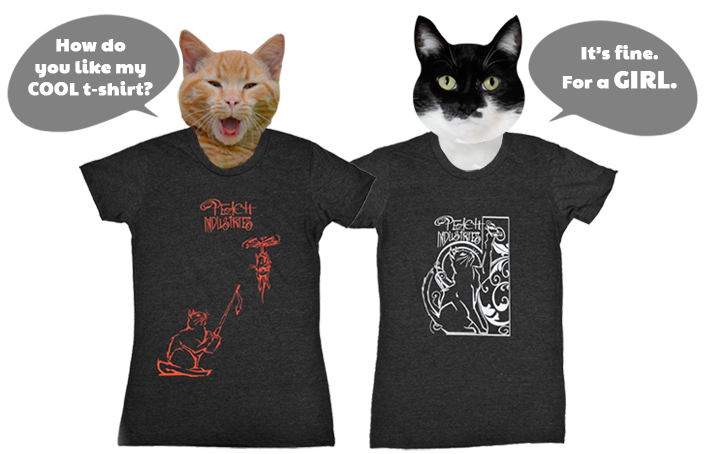 and the Women’s Peach Industries T-Shirts Charcoal Cat & Butterfly. and likes you on fb! Cool giveaway, that looks like a great thing to lay on. I like the watercolor one the best. My Mum says she likes the cat and butterfly shirt in large charcoal. We like your FB page...amandasnap is the screen name. We like the Cat and Butterfly lounger. In case our e-mail isn't linked, we are at: fureverywhere (at) gmail (dot) com. Our mom liked Peach Industries' Facebook page! We shared your giveaway on our Facebook page, too. OMC! I was almost too late! Waffles: is Katie allowed to use the lounger? I like the gray kitty lounger and the cat & butterfly t-shirt, size large. Email is gimmemore77@yahoo.com. Thanks, Star. I have liked Glogirly on facebook. Email is gimmemore77@yahoo.com. Thanks, Star. I liked Peach Industries. Email is gimmemore77@yahoo.com. Thanks, Star. I follow Glogirly on Pinterest. Email is gimmemore77@yahoo.com. Thanks, Star.